The bestselling author of Encyclopedia an Ordinary Life returns with a literary experience that is unprecedented, unforgettable, and explosively human. Ten years after her beloved, groundbreaking Encyclopedia of an Ordinary Life, #1 New York Times bestselling author Amy Krouse Rosenthal delivers a book full of her distinct blend of nonlinear narrative, wistful reflections, and insightful wit. It is a mighty, life-affirming work that sheds light on all the ordinary and extraordinary ways we are connected. Like she did with Encyclopedia of an Ordinary Life, Amy Krouse Rosenthal ingeniously adapts a standard format—a textbook, this time—to explore life’s lessons and experiences into a funny, wise, and poignant work of art. 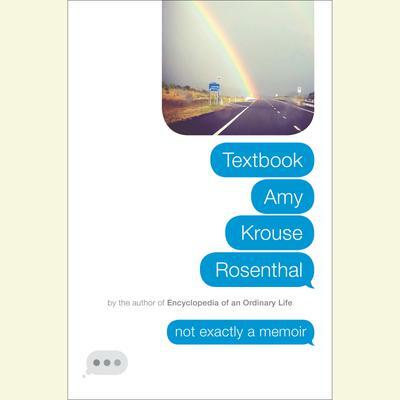 Not exactly a memoir, not just a collection of observations, Textbook Amy Krouse Rosenthal is a beautiful exploration into the many ways we are connected on this planet and speaks to the awe, bewilderment, and poignancy of being alive.